Normal values may vary depending on the individual laboratory. However, the MCHC, as measured by a multichannel analyzer nowadays, is not affected by plasma trapping, which typically results in slightly increased hematocrit. MCHC is not then decreased when there is hypochromasia. Therefore, MCV together with red cell distribution width (RDW) have become the two most useful parameters in classifying anemias, while MCH and MCHC do not add significant, clinically relevant information. [3, 5] MCH and MCHC, nonetheless, play an important role in laboratory quality control. [2, 3] These parameters allow laboratories to detect potential causes of erroneous results, such as hyperlipidemia or hemolysis (both in vivo and in vitro), so the correct results can be reported. Whole blood tube with lavender closure and EDTA potassium salt additive. 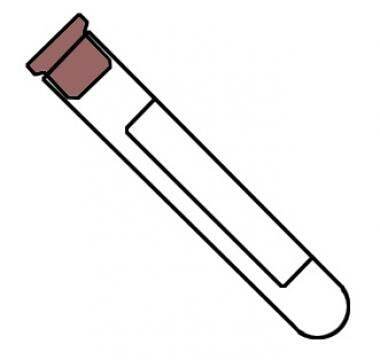 Certain pathologic conditions such as anemia are associated with a low RBC count (too few river tubes in the river). 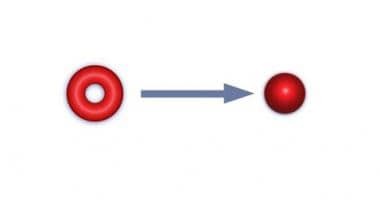 The images below demonstrate how different types of anemia can be thought of with this analogy. Simplified illustration of different types of anemia. 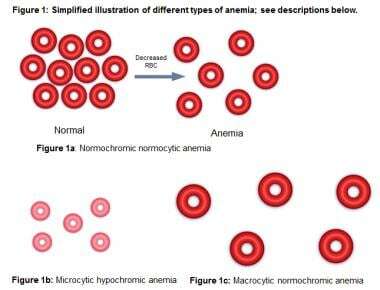 1a) Normochromic normocytic anemia: normal MCV (normal RBC size = normal tube size), normal MCH (normal hemoglobin in each RBC = normal amount of air in each river tube), normal MCHC (normal average concentration of hemoglobin in a given volume of packed RBCs = normal density of air, i.e., normal inflation); 1b) Microcytic hypochromic anemia: low MCV (small RBC size = small tube size), low MCH (less hemoglobin in each RBC = less air in each river tube), low MCHC (low average concentration of hemoglobin in a given volume of packed RBC = low density of air, i.e., underinflation); 1c) Macrocytic normochromic anemia: high MCV (large RBC size = large tube size), high MCH (more hemoglobin in each RBC = more air in each river tube), normal MCHC (normal average concentration of hemoglobin in a given volume of packed RBC = normal density of air, i.e., normal inflation). Normal MCH and elevated MCHC in hereditary spherocytosis (ball-shaped RBCs): Imagine the river tubes were bitten by alligators (loss of surface) and reconstructed into balls with the same amount of air (normal MCH); therefore, the balls will be overinflated (high MCHC) due to the reduced surface/volume ratio. Vajpayee N, Graham SS, Bem S. Basic Examination of Blood and Bone Marrow. McPherson RA, Pincus MR. Henry’s Clinical Diagnosis and Management by Laboratory Methods. 22nd ed. Philadelphia, PA: Saunders, an imprint of Elsevier Inc; 2011. Chap 30:509-35. Perkins SL. Examination of the Blood and Bone Marrow. Greer JP, Foester J, Rodgers GM, et al, eds. Wintrobe’s Clinical Hematology. 12th ed. Philadelphia, PA: Lippincott Williams & Wilkins; 2009. Chap 1. Ryan DH. Examination of Blood Cells. Lichtman MA, Kipps TJ, Seligsohn U, et al, eds. Williams Hematology. 8th ed. New York, NY: The McGraw-Hill Companies, Inc; 2010. Chap 2. Perkins SL, Hussong JW. Red Blood Cells. Jones SL, ed. Clinical Laboratory Pearls. Philadelphia, PA: Lippincott Williams & Wilkins; 2001. 61-96. Marks PW, Glader B. Approach to Anemia in the Adult and Child. Hoffman F, Benz EJ, Shattil SJ, eds. Hematology: Basic Principles and Practice. 5th ed. Philadelpha, PA: Churchill Livingstone; 2009. Chap 34:439-46. RBC indices. A.D.A.M. Medical Encyclopedia. Atlanta, GA: A.D.A.M., Inc; 1997-2014. Updated February 8, 2012. Available at http://www.nlm.nih.gov/medlineplus/ency/article/003648.htm. Accessed: February 1, 2014. Elghetany MT, Banki K. Erythrocytic Disorders. McPherson RA, Pincus MR. Henry's Clinical Diagnosis and Management by Laboratory Methods. 22nd ed. Philadelphia, PA: Sauders, an imprint of Elsevier Inc; 2011. Chap 32:557-600. Means RT, Glader B. Disorders of Red Cells. Greer JP, Foester J, Rodgers GM, et al, eds. Wintrobe's Clinical Hematology. 12th ed. Philadelphia, PA: Lippincott Williams & Wilkins; 2009. Chap 26. The authors wish to thank Karen Prince for her assistance with the illustrations.